An "Interference Figure" is a phenomena which details what a specimen produces at the rear focal plane of a transmitted light lens system. This colorful figure is used for material diagnosis and identification. The Bertrand lens on a polarizing microscope is used to perform conoscopic observation to view interference figures. Interference figures are achieved with certain specimens like crystals whose field of view becomes extinct when viewed under cross polars. 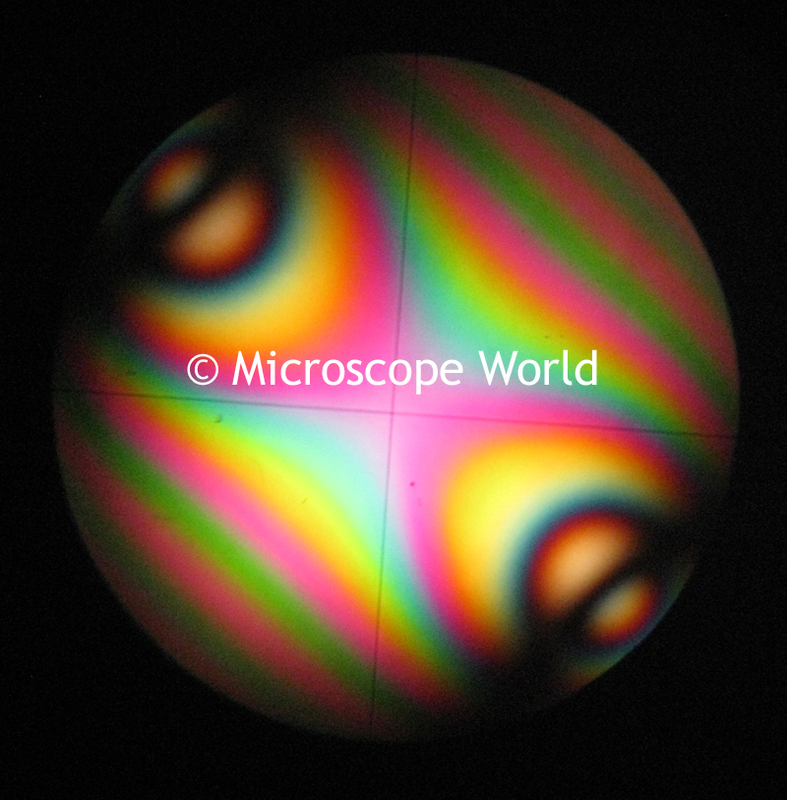 When setting up your polarizing microscope, in order to make sure the polars are crossing correctly you will want to use an interference figure slide. This is a slide that is purchased separately from the microscope. Place the interference figure slide on the stage and make sure the 40x objective lens is in place. Bring the specimen into focus and turn up the transmitted light to its brightest setting. Engage the analyzer and swing the polarizer into place (usually it is located above the light source). While you are looking through the eyetubes rotate the polarizer and find the point where the field becomes darkened (this is the back of the focal plane). Engage the Bertrand lens. Immediately you should observe some type of interference figure with colors and patterns. As you rotate the stage to create the correct cross pattern the colors will change. Ultimately you want to achieve images such as these - sharp and colorful four part images. 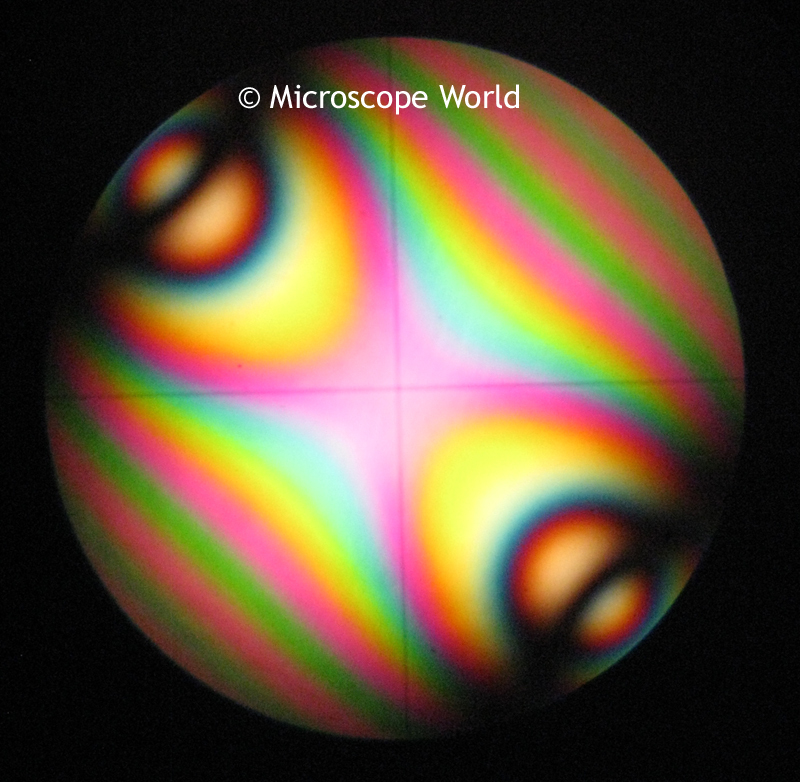 Polarizing interference figures seen through the MT9200 polarizing microscope.